There isn't a long list of high-performance wagons that have been sold Stateside. The Mercedes E55/E63 AMG estate and CTS-V wagon come to mind. Also, the Audi S6 Avant sold from 2001-2003, and maybe a couple of E34 M5 estates that snuck in via the gray market. 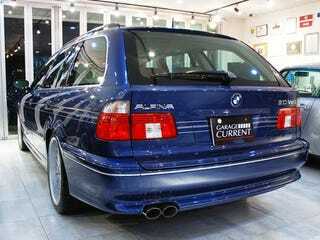 But people often forget that, while there was no production E39 M5 wagon, there was the Alpina B10 V8. In production from 1997 through 2003, the B10 V8 was based on the 540i, which itself had a 286 bhp, 4.4L V8. In the B10, Alpina increased the displacement to 4.6L, also installing a new crankshaft, more aggressive camshafts, lighter and higher-compression Mahle pistons, and reprogramming the Motronic system. The result was 347 bhp and 480 Nm of torque at 3800 rpm. In wagon form, the B10 V8 achieved 0-60 mph in just over 6 seconds, with a top speed of 167 mph. While it didn't quite hit M5 levels of performance, it was the meanest wagon to wear the blue propeller badge until the introduction of the Euro-only E60 M5 estate. And unlike the latter, the Alpina could be had in the United States...if you could stomach the original price tag, which equates to about $175K in today's dollars.